Volunteers sort food at the Los Angeles Regional Food Bank. 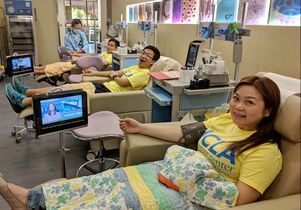 Ivy Lam, vice president of the UCLA Alumni Hong Kong Network, helped organize a blood drive in which 17 people donated blood. 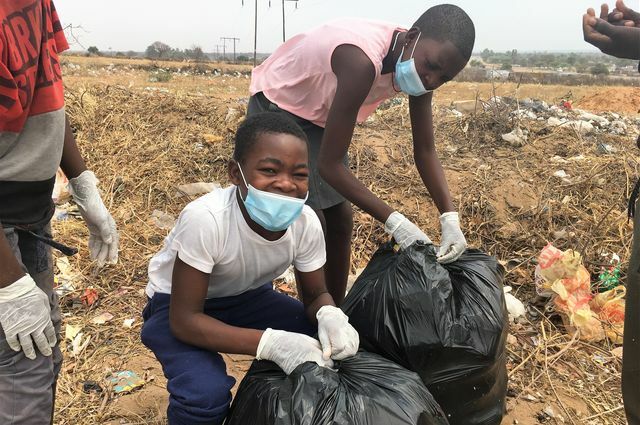 Alumna Eunice Lee, now in the Peace Corps, led 14 of her students to a dumping site in Namibia and they picked up 16 bags of trash. 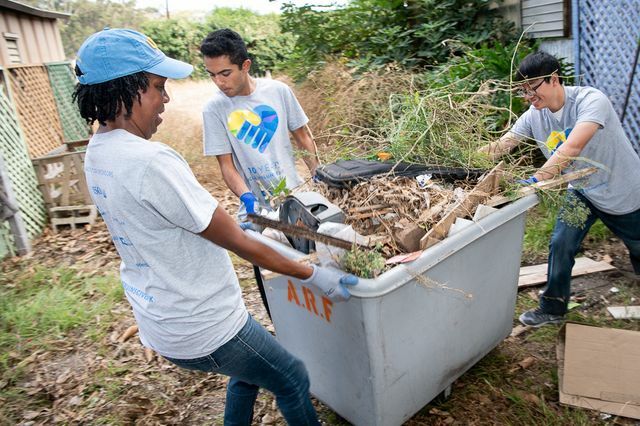 Volunteers remove garbage from a 15-acre garden at the West Los Angeles Veterans Affairs campus. Scott Waugh, UCLA executive vice chancellor and provost, thanks the volunteers at the West Los Angeles Veterans Affairs campus. Volunteers in the John Wooden Center put together hygiene kits for the homeless. Thousands of UCLA volunteers flooded into their local communities on Sept. 29, lending a hand with work like helping the homeless at the Union Rescue Mission on Skid Row, clearing a run-down garden alongside veterans at the West Los Angeles Veterans Affairs campus, and visiting with the elderly at a Westwood senior home. 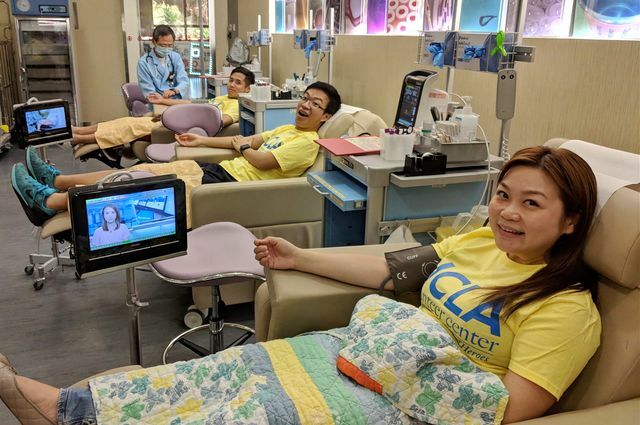 Before any of those volunteers had even woken up, overseas Bruins had already tackled projects including a village cleanup in Namibia and a blood drive in Hong Kong. 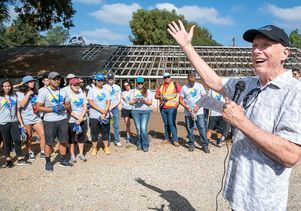 It was all part of UCLA’s 10th annual Volunteer Day, and the first time the day became a global day of service. Alumni like Eunice Lee, who led the project in the Namibian village of Kasote, have gone from participating in Volunteer Day at UCLA as students to leading projects around the world. 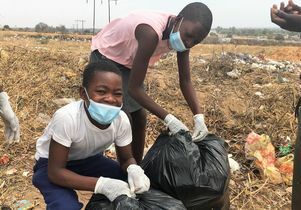 Lee, an English teacher in the Peace Corps, guided 14 students aged 12-15 to a trash-strewn site where people from the nearby town often leave trash instead of taking it all the way to Rundu Dumping Site. The students hauled 16 bags of trash off their road and to the dump. Bruins completed thousands of hours of volunteer work for Volunteer Day at 70 locations. 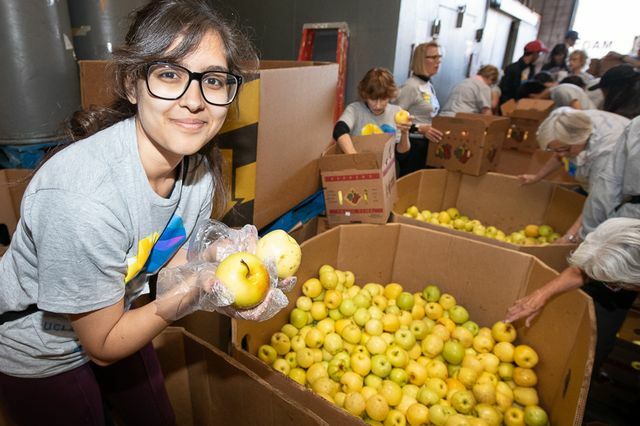 This year’s projects took place at schools and homeless shelters, veteran sites and food banks, with estimates of 2,681 total volunteers among the 52 projects in Los Angeles County and the 18 additional locations from San Diego to Washington D.C., Namibia to Taiwan. Counting volunteer time spent planning the 70 projects, this works out to an estimated 18,767 hours contributed this year at a rough value of $463,000 to the communities, according to the UCLA Volunteer Center, which organizes the annual day of service from within UCLA Alumni Affairs. Since it began in 2009, the 10 Volunteer Days have included more than 54,000 volunteers on more than 400 projects, contributing in excess of 330,000 volunteer hours at an estimated value to the community greater than $8.5 million, according to the Volunteer Center. “When Volunteer Day began in 2009, part of the mission was inspiring students to begin a lifetime of service to their communities. 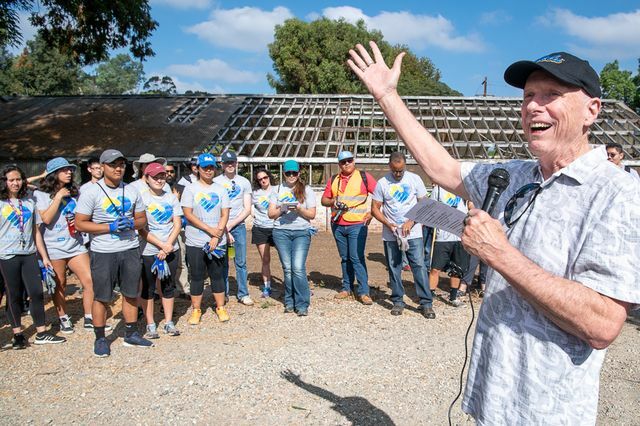 Now, some of our first volunteers have become the alumni behind the global reach of this year’s Volunteer Day,” said Karen McClain, lead organizer of the 10th Volunteer Day and senior director of athletics partnership and strategic initiatives for UCLA Alumni Affairs. And although Volunteer Day has expanded to an international event, at its heart it’s still also a first-year student experience. 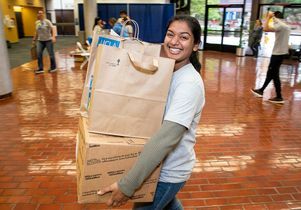 Though classes started Thursday, hundreds of the volunteers were new first-year and transfer students who signed up to make volunteering one of their first UCLA activities. 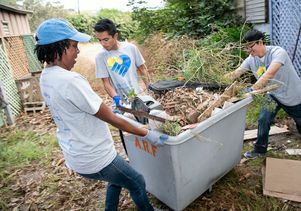 “It seemed like a big-deal event to be a part of at UCLA,” said first-year student Katrina Koo as she planted collard greens in a garden at the West L.A. V.A. with two new friends, who nodded in agreement. Elsewhere at the 51 other projects in Los Angeles County, volunteers organized supplies at My Friend’s Place homeless youth shelter in Hollywood, and sorted food donations at the Los Angeles Regional Food Bank south of downtown. They painted and cleaned the Los Angeles Child Guidance Clinic, and gardened and painted at the La Tijera K-8 Academy in Inglewood. 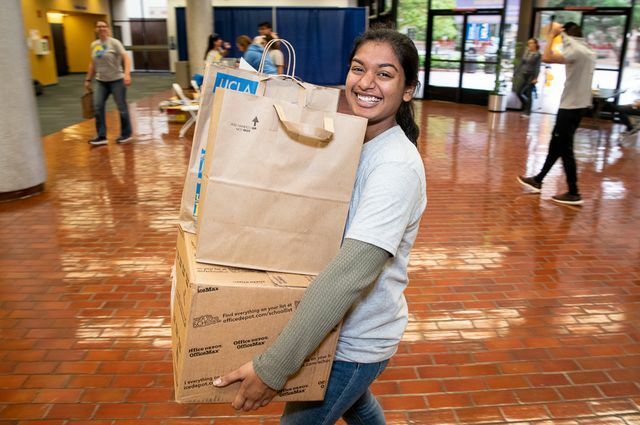 On campus at UCLA, volunteers created hygiene kits for the homeless, and wrote letters of appreciation to soldiers around the globe through Operation Gratitude. At the 18 sites outside Los Angeles, volunteers organized food donations at a pantry in Pennsylvania, restored monarch butterfly habitats in Minnesota, cared for shelter dogs in Taipei, and developed Phoenix Garden, a planned therapeutic garden for a juvenile detention center in San Mateo. Volunteers at the 15-acre veterans’ garden became part of an almost-two-year project to revive the run-down garden at the west L.A. branch of the Veterans Affairs of Greater Los Angeles Healthcare System. UCLA’s student veterans worked with the V.A. to informally adopt the site, and began volunteering there once or twice a month in January of 2017 with support from UCLA’s Veteran Resource Center and other campus groups. They aim to create a comfortable community gathering space, where local veterans can garden, exercise, and enjoy picnics and other wellness activities, explained Nick Gunnett, a Navy veteran, a UCLA senior and a Veteran Resource Center intern who helps run the garden project. 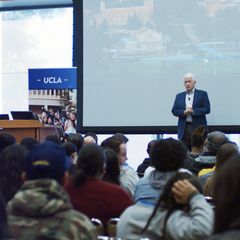 The work demonstrated UCLA’s commitments to service and to veterans, said UCLA Executive Vice Chancellor and Provost Scott Waugh in a speech at the garden. After an energetic eight-clap, veterans and other volunteers returned to work. Matthew Proctor, a Marine Corps veteran, UCLA senior and president of UCLA’s Student Veterans of America chapter, looked around at the enormous progress that had already been made. Some of the volunteers were veterans who live at the West L.A. V.A., like James Wade, who served in the army.